In the past decade, on average one journalist is killed for reporting the news and bringing information to the public every week. In nine out of ten cases the killers go unpunished. 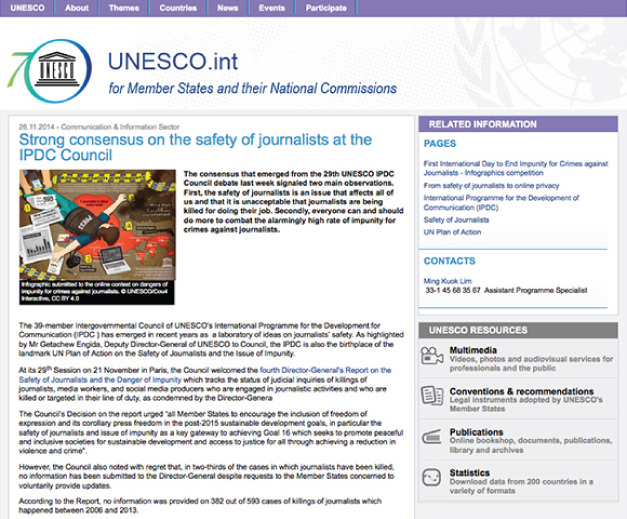 UNESCO would like to raise public awareness about ending Impunity for Crimes against Journalists. 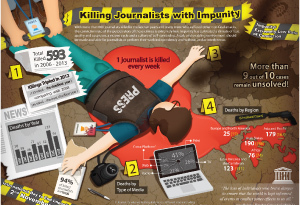 This infographic and motion graphics video are developed to illustrate the issue of impunity. One journalist is killed a week on average for doing their job of bringing news and information to the public. Much more suffer other kinds of attacks, threats, and harassments, including imprisonment. 2014 is the first year for the UN’s International Day to End Impunity. This award-winning infographic aims to raise global awareness of impunity, and make this grim topic shareable while still communicating the seriousness of the issue. This issue of impunity is discussed through a visual story, which provides a strong visual impact to the readers. This infographic has been translated into various languages. The data from UNESCO was reorganised into 4 major parts, and was illustrated and incorporated as evidence found at the crime scene. The readers become the investigators who examine the evidence and gradually learn about the issue of impunity. At last, the quote by the Director-General of UNESCO serves to round up the impact of impunity to everyone in the world. In order to create an excellent work efficiently, both clients and our team have to work closely together at all stages. This Ending Impunity infographic serves as a great example of our creative process. Objectives: purpose of the infographic – branding, marketing, explaining complex concept/info, training, etc. Dimensions and orientations: portrait or landscape? any specific dimensions or constraints? Before we move on to graphic design, our team will develop and share a creative draft of the infographic which outlines the content structure and information included in the graphic. All changes to content and its structure should be made at this stage; or else, changes made while the design is in progress would disrupt the project schedule and increase its scope. Our design services include two revisions. Timely feedback at different phases of design will help keep the project running smoothly. Sketch is to present the layout and graphic elements. At this stage, client should feedback on the layout, graphic elements, and information hierarchy. Once content structure is confirmed, we will move on to the 1st draft. For the 1st draft, the client should address display of information and any major changes to copy or data. As for the 2nd draft, the client should provide final feedback on any copy changes and minor tweaks. Charges may apply for additional revisions. Upon final approval, we will deliver the final file in the format of JPG for the static infographic. An additional fee is needed for the provision of source files or other file formats. If you are looking for a unique and appealing infographic, just [ contact us > ] to learn more about our services. 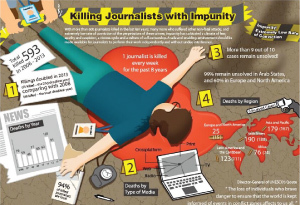 Our infographic has been selected to elaborate the high rate of impunity for crimes against journals in a [ news article > ] by UNESCO. 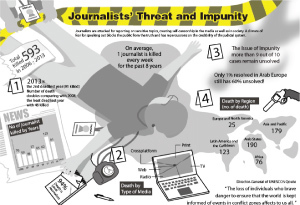 The article reports that a strong consensus on the safety of journalists has been reached at the IPCD Council that killing of journalists is unacceptable and affects us all and everything should do their best to fight against impunity for crimes against journalists. This infographic and related articles have been used in press releases, presentations, and publications to attract the journalists and media to report on the issue and embed or reprint the infographic.